"This unique contemporary North African pasta dish combines Algerian, French, and Italian culinary sensibilities into one beautiful pasta featuring a white sauce with bite-sized chicken pieces. Serve over bow-tie, rotini, cheese ravioli, or tortellini pasta." Warm olive oil in a large skillet over medium heat. Place the chicken pieces in hot oil; cook, turning, until browned on both sides. Stir in cayenne, white pepper, and garlic. Pour in water, and cook until the chicken is done and the water has evaporated, about 30 minutes. Stir in butter and saffron threads; cook for 10 minutes. Add cream cheese, stirring until melted and smooth. Gradually whisk in cream, smoothing out any lumps. Stir in Parmesan, and cook until the sauce reaches the consistency you like. If it becomes too thick, stir in a small amount of milk. 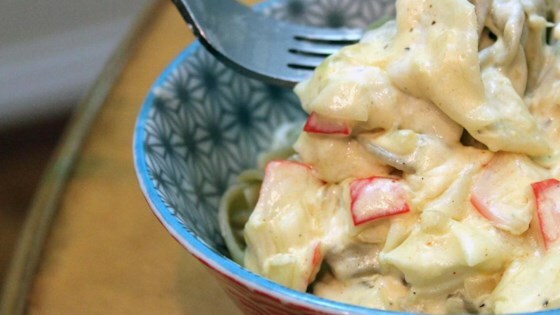 See how to make a rich and creamy chicken Alfredo. will continue my search for another recipe like this, followed recipe to a T.